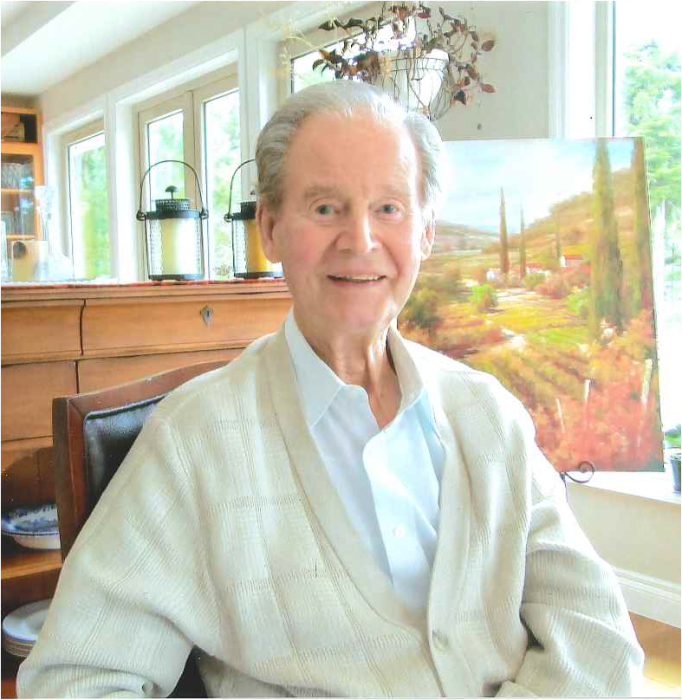 Obituary for Michael Legh Bluett Winch | Qualicum Beach Memorial Services Ltd.
At the age of 93 and after a long decline in health, Michael passed away peacefully at Nanaimo General Hospital on March 25, 2019. He is survived by his wife Lyla of almost 20 years, his three daughters Carol (John), Susan (Kaywood) and Debby (Bruno), his stepchildren (Cheryl-anne and Russell), his grandchildren (Lisa and Michael), his two sisters Myra (Len) and Anne, and many nieces, nephews, cousins and their children. Michael was born in 1925 in Buckinghamshire, England to Christopher and Rosemary Winch. He attended private schools, Chard and Lord William’s College, Oxford and matriculated in 1941. Many years later, he continued his education at Ryerson and Sheridan College, Oakville earning degrees in Business Management and Manufacturing Engineering. In 1945-48, Michael became a pilot in the Royal Air Force; during his training, he came to Canada which led to his choice to move his young family here in 1951. In his teen years he started on his road to becoming a tool and die maker when he worked for a company that happened to make as one of its products, cigarette lighters. Since he had started smoking then, he thought he would like to make lighters too but this involved learning to be a tool and die maker. Once he became a tool and die maker, he worked for several UK companies, and then joined Wilson Lighting (Toronto) where he worked for 20 years, eventually becoming Plant Manager. He left Wilson’s in 1974 to work at Westeel Rosco as a Plant Manager, finally working for the last 12 years of his career at Bloomfield Industries as Canadian CEO. He retired in 1989. Michael was a loving family man. He met and married Gladys Sell in 1948. They became proud parents of Carol (1949) and Susan (1950) and then decided in 1951 to leave England and settle in Toronto. Times were hard over the 1950’s but gradually they were able to afford a 3 bedroom apartment and a car. In 1960-62, the family moved to Medicine Hat, Alberta to open a branch of Wilson Lighting. In 1962, soon after moving back east and settling into a new house in Oakville, Ontario, they welcomed the birth of their third daughter Debby. After Carol and Susan left home, the family moved to Mississauga. Sadly, Gladys died of ALS in 1997 after Michael had devotedly nursed her at home for 4 years. Two years later, Michael found love again and married Lyla. Together they moved to Parksville, BC and resided in Craig Bay. Michael and Lyla have enjoyed busy lives together – travelling to many exciting countries, hiking, ballroom dancing, badminton, boating, visiting with family and a multitude of old friends. The last four years have been quieter as he suffered various health issues which were made easier to bear with Lyla’s devoted and constant care. However, he still enjoyed weekly family dinners, games of Mexican Trains and cards, and sitting on their lovely patio during long summer days. It also brought great happiness to him that all three daughters and their spouses, as well as his stepson Russell, moved out to Parksville/Qualicum for the last 6 years of his life. Dad will be sadly missed by all who met him. He was a wonderful man, smart and funny and kind. We love you, Dad, now and forever! In lieu of flowers, please donate to a charity of your choice. Rest in peace, Pop!